Have you met Toby? We got him when he was about 6 weeks old. He will be 1 this month. He is such a joy to have around. Don't you just love those big brown eyes - They can get me to do anything !! 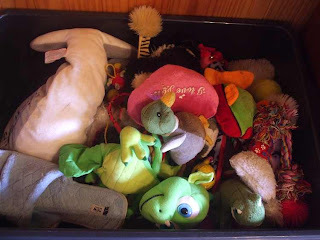 Here is Toby's toy box - He loves all of his toys and takes turns as to which is his favourite - It is worse than having a toddler in the house because he scatters them from one end to the other. But it is also very fun because he drops them at your feet ready for you to play with him. He is a precious little soul. 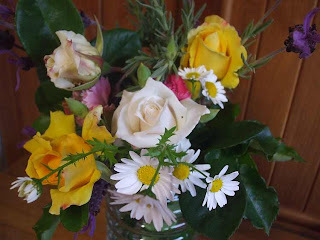 One of my most favourite things to do on a Sunday is to take a wander in the garden with a pair of scissors to cut my weekly posy of flowers for display in my kitchen. This is this week's selection. The roses are really starting to bloom now and have such beautiful fragrance. Here is a project that I have ready to start stitching tonight. It is for a "special" blogging friend. I have even cut into my Mary Rose stash for this one - OUCH !!!! It is the Shabby Cushion designed by another of my dear friends - Jenny of Elefantz. Also don't forget about the release of another Gum Nut design tomorrow from another of my nutty sisters. It is just beautiful. Oh my Toby is absolutely precious! 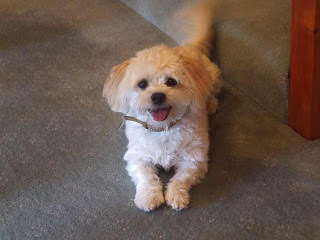 Toby certainly touches one's heart - I have two little Maltese who are sadly getting quite old! Your little Toby is adorable!! What kind of dog is he?...besides being incredibly cute that is...! PS...have you finished your stitchery yet? Toby is PRECIOUS!!!! Is he a Bichon? Oh he's adorable. I just want to hug him! Your flowers are so beautiful, I'm looking at dead trees bare of leaves already. Sigh. I wish I could smell your roses. 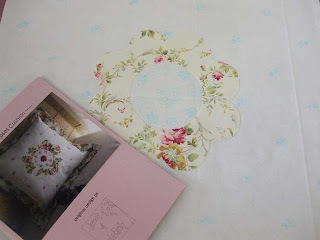 Your cushion is going to turn out darling, I know - I have that one too and plan on coordinating it with my shabby roses quilt. Awwwwww Fee Fee I think I'm in love!!! That face, those eyes ..... he's utterly ADORABLE, totally irresistable!!! Bear just pointed out that you can see the 'blur that should be his tail' in the first piccy he he he ... obviously he's a happy lil chappy :o). Toby is just adorable. One to just cuddle with. 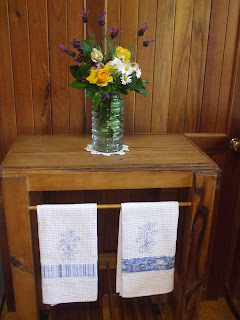 Love the flower arrangement, wish I had some cut flowers. Your project will be just lovely when completed. 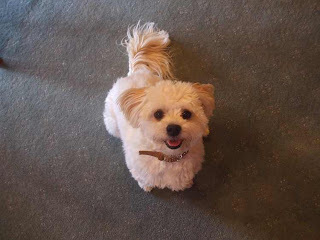 Toby is just gorgeous and he reminds me how much I miss our little dog that lost 12 mths ago. Maybe it is time to look for a new puppy!! Your flowwers look lovely. Nothing like a nice bunch of fresh flowers in the house. Toby is so darling! We lost our old dog two years ago, and I miss him terribly. Hopefully one day we'll get another one... just not ready yet. certainly touches one's heart - I have two little Maltese who are sadly getting quite old! Awwwww! Toby is just adorable! Your flowers are beautifully ... lucky you to have such a productive garden. Toby is gorgeous! I dont think I had seen him before!